Welcome to BlastGear! We most commonly offer T-shirts, hoodies, and babydoll shirts in a variety of colors and sizes... but we can get other garments, too (i.e. V-neck shirts, jerseys, aprons, bags, etc.). We have a great design team and everything produced is made to order. We offer an ever expanding selection of our own unique designs, and we stock a large selection of pre-cut designs from licensed resellers. We're super easy to work with and can create anything you'd like to see on any type of garment. Just let us know what you're looking for! ► This shirt can be customized! 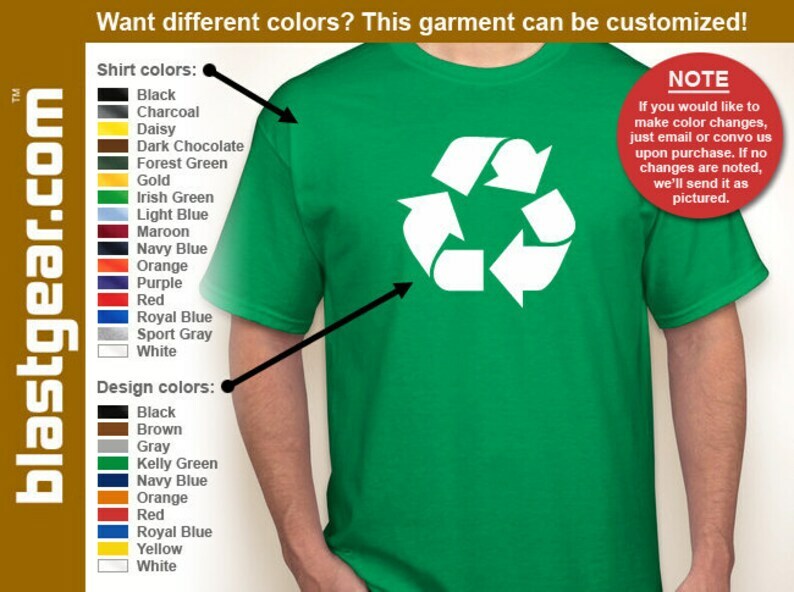 Change the shirt color, design color, or both! S = 28" x 18"
M = 29" x 20"
L = 30" x 22"
XL = 31" x 24"
2XL = 32" x 26"
3XL = 33" x 28"
4XL = 34" x 30"
5XL = 35" x 32"
XS = 18" x 14"
S = 20.5" x 16"
M = 22" x 17"
L = 23.5" x 18"
XL = 25" x 19"
Other questions? Click on "View shop policies" or "Contact the shop owner" below. Information related to payment, shipping, returns, feedback... it's all there. Bulk orders are available, and we'll mix and match! Nothing is out of the question. My brother smiled when he saw it - thank you! Fits perfectly, great quality comfortable hoodie. I love it. This is my third shirt from BlastGear and the experience was just as expected. (It's dangerous, being able to put whatever comes to my mind onto a tee! *wink*) Purchased March 4, delivered March 21. Thanks! Very easy to work with and an awesome custom shirt! We accept credit cards through PayPal and Etsy! You can also pay by eCheck via Paypal, or you can mail a check or money order. Credit card payments post immediately, but eCheck payments can take 3-7 business days to clear (we can only ship if your payment has cleared). We'll always work with our buyers regarding returns or exchanges. We accept returns and exchanges within a reasonable period of time in relation to the receipt of your shipment--we'll work with you (washed or worn garments will not be accepted). In addition, if a custom request error was made on the part of the buyer, we cannot accept a return. Contact us before you make a return, so we know to watch for it, and If possible, please return your purchase in its original packaging, wrap securely, and include a note detailing your return or exchange. Once received, we'll work to get a refund processed for you, or ship your new garment promptly. As all items are handmade, your order is assembled once you order. Orders generally ship within 2-5 business days after payment (this does not include weekends or holidays). So if you order and pay on a Friday, for example, your package will usually ship the following Tuesday, Wednesday, or Thursday. While I don't ship with traditional tracking, I do subscribe to a retail-based bar code scanning system called Scan Data—there is a bar code you’ll see just above your address once you receive your package. This alerts me when your shipment has reached your destination post office. If you have questions, just convo or email us! We work to reply to all inquiries as soon as we get them.